A lonely Antarctic penguin, dreaming of adventure, sets off on a long swim north. Arriving at last in London in 1935, he encounters the chance of a lifetime: auditions are on to find the face of a brand new publishing house. 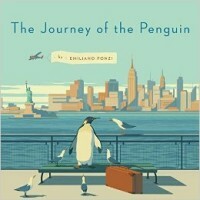 The penguin wins, of course, and so begins an adventure that takes him on to New York and into the hearts of readers around the world.